Working in customer service is a tough job that requires lots of interpersonal skills. 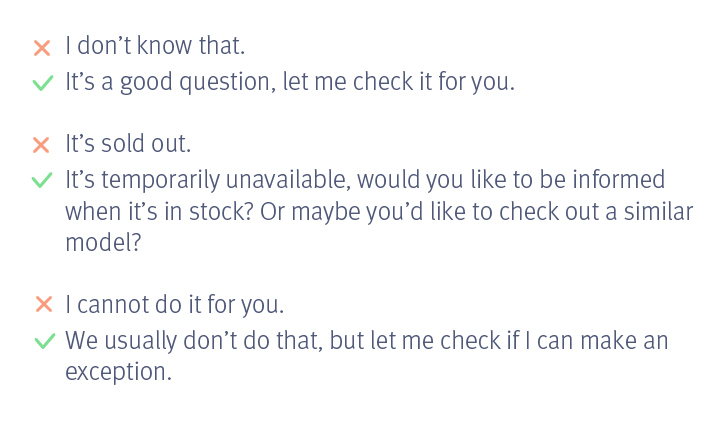 After all, customer service is about resolving problems, right? Your clients won’t contact you because they want to have a nice chat. They will want you to explain something, fix something or do something for them. Some of them will be upset; others will be angry. That’s why a customer service agent needs a lot of intuition and empathy to solve their problems and avoid unpleasant situations. The problem is, customers sometimes request something that you can’t do for them. It might be against the policy or, even against common sense. In such situations, you’ll have to admit it, hoping that they won’t burst with anger. Luckily, there is one universal way helping to avoid conflicts, keep customers happy and deliver exceptional customer service. It’s positive communication, the ability to convey messages, even negative ones, positively. Communication is not only about words and exchanging information. Words are a crucial part of the message, but the tone we’re using and body language also matter. Why are body language and tone are so important? It’s more likely that the receiver will trust nonverbal forms of communication than the literal meaning of words. According to Albert Mehrabian’s study, people trust tone and gestures (38% and 55%), rather than words (7%). It is known as the 7%-38%-55% rule and is one of the essential theories proving that body language can be more important than the actual words. Imagine that you made a purchase with a delivery, but it turned out that they sent your order to somebody else. You’d expect a refund and an apology, right? And now, imagine that there are two store clerks and both of them are apologizing to you. First of them is standing in front of you and he says I’m very sorry. They sustaine the eye contact. Their facial expressions show they engaged in the conversation. They use open gestures. I guess you’d accept the apology. But what would happen if the other said I’m very sorry that happened, but they would be sprawled in a chair and texting at the same time? I don’t know how about you, but I would be mad to see something like that. Always smile when you greet or talk to customers. Even if you are speaking on phone and customers can’t see you, it makes a huge difference in your voice tone and they will hear you smiling. If you sell in-person, learn to maintain eye contact. Sit or stand up straight when talking with the customer. Remember to relax your shoulders. The most critical and difficult part is always to try to think positive. Negative thoughts come through in a body language! According to Vertical Response study, 65% of customers prefer a casual tone to a formal one. Using friendly tone in neutral situations is much more appreciated. It makes the whole customer service experience more personal and improves the relationship with the audience. Even if you have to say something that might not please a customer, your tone will help you to convince the customer that you’re sorry and calm them down. Of course, we need to assess when being casual is too casual. Instead of using slang words, it’s safe to stick to natural language. Also, remember to tailor your tone to the situation. It’s not a good idea to start an informal chat when the customer complains. If a case is sensitive, if your customer is upset, if you have to apologize or deny customer’s request, you should rather go formal. You’re not allowed to do it. It’s temporarily impossible to do it. In such a situation you will have to inform them that their request cannot be fulfilled — and you have to resolve it positively so that your customer doesn’t get upset. The most important rule of verbal communication is to forget no, can’t and don’t as these are the worst words that can be said to a customer. If you have to tell your customer that a red dress is unavailable, as them if they would like to check it out in a different color. If they want it to be red, you can find out a similar model and suggest checking it. It’s all about you showing to the customer that you’re willing to help. A great thing about positive communication is that every person can master it. There are a couple of rules for you to follow if you want to provide better customer service. Such things like being attentive, active listening, letting your speaker finish, are essential for every conversation, not just between a customer and a representative. It’s also very important to use the right words and avoid these pesky negative ones so you sound like you want to help your speaker. You should always sound helpful, so if you cannot do what customer asks you to do, suggest an alternative solution. Use the right tone of voice and if not necessary, try to avoid being too formal (no one likes to talk to robots) and control your body. People pay more attention to nonverbal communication than you think!